If you require a colour shaper that is out of stock please email us for a delivery date. 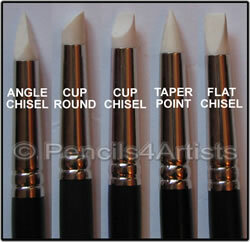 Colour Shapers are a unique tipped tool used for pastel blending as well as removing paint or applying masking fluid. The ivory tip is softer and more suited to blending pencil, pastel & charcoal while the grey tip is firmer and is for heavier body paints, glue, batik wax. Create linear strokes and make broad forceful marks. Work from thick to thin and make precise marks. Create soft edges and blend pastel and charcoal.